Peru has been on my wishlist for quite some time and my recent visit to TONO Cevicheria at Duo Gallery just up that desire by a notch. Even before the dishes came, I was already captivated by Chef Tamara's enthusiastic sharing of her menu which encompasses the essence of Peru's culinary tradition. 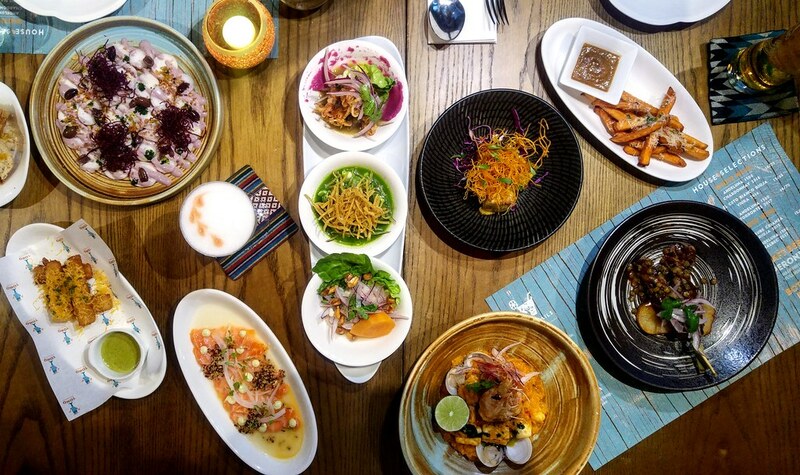 With Peruvian ceviches at the core, the menu maps out the rest neatly into Tapas, Rice & Pasta, Fish & Seafood, and Meat. 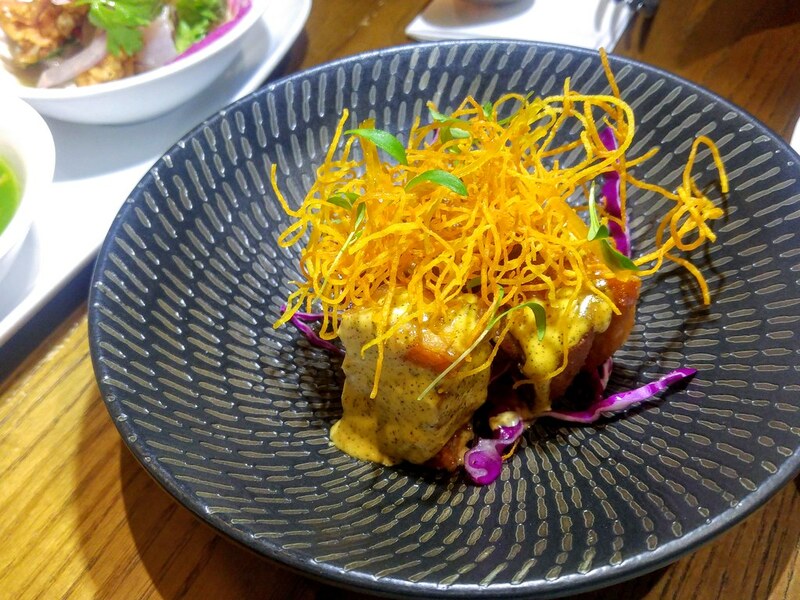 I learnt that Peruvian cuisine is a smorgasbord of various cultural influences, largely from the Italians, Japanese and Chinese, which eventually evolved into Italian-Peruvian fusion, Nikkei and Peruvian chifa dishes respectively. With so much novelty within the menu, I was so fortunate to have a go at quite a number of them at sampling portions. 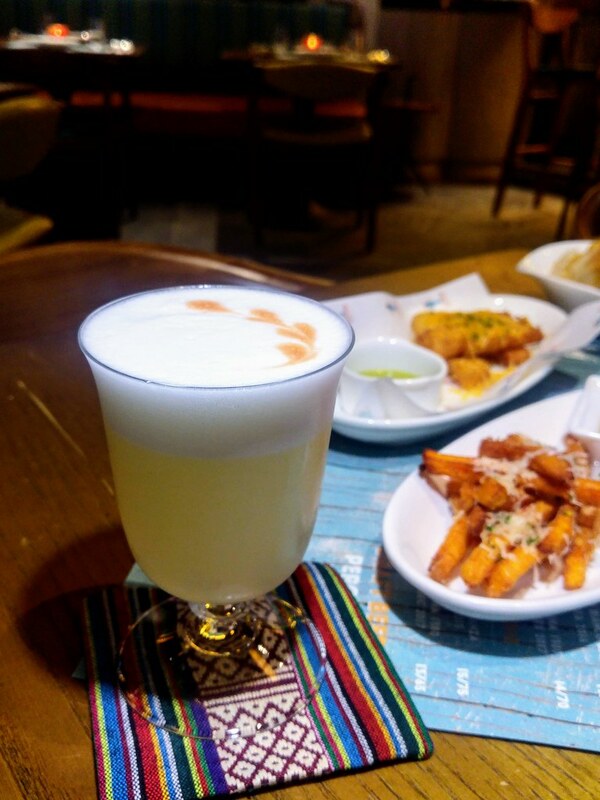 A serving of their Pisco Sour ($18), concocted with Peruvian Pisco, will be enough wake up your appetite. Enjoy it with some snacks - Camotitos ($8) and Yukitas ($10), that are served with Peruvian style sauces. The Peruvian sauces bring these everyday finger food to life with their bright and piquant nature. 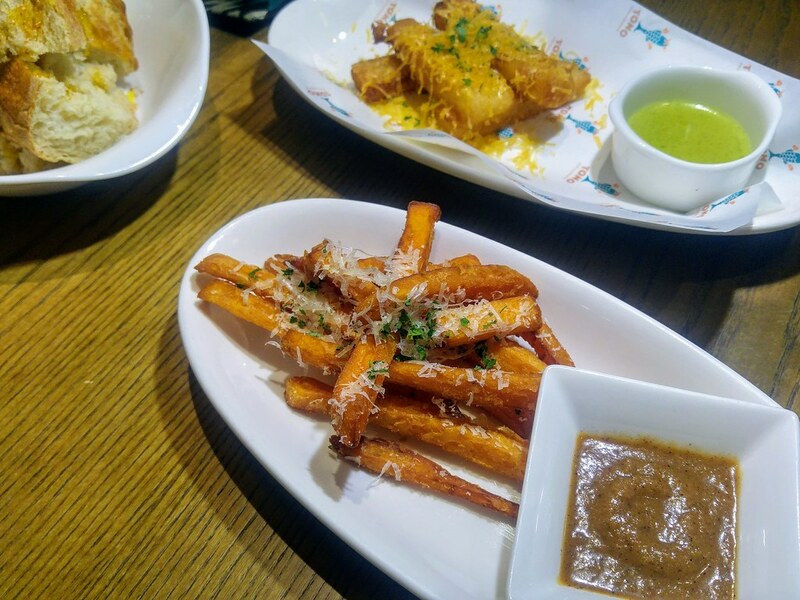 While you may be familiar with Camotitos which is basically sweet potato fries, Yukitas is Tapioca fritters that is exceptionally crispy on the outside. 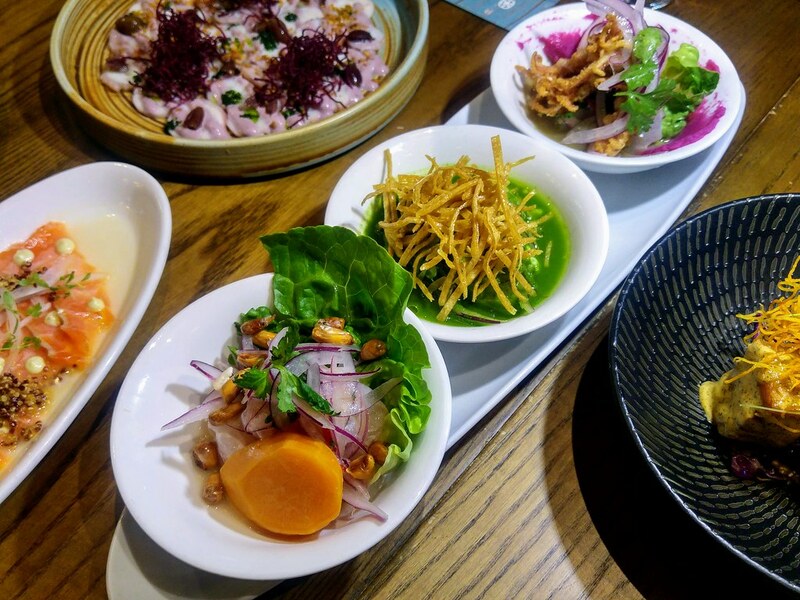 Peruvian ceviches has evolved in the hands of the Japanese. They just could not accept cooked fish, could there? The classic version has the raw fish marinated in the citrus juice for hours and the fish chunks will be cooked by the time they are served. You will see the modern version closer to the making of sashimi, in which the raw fish will be served after within minutes of marination. 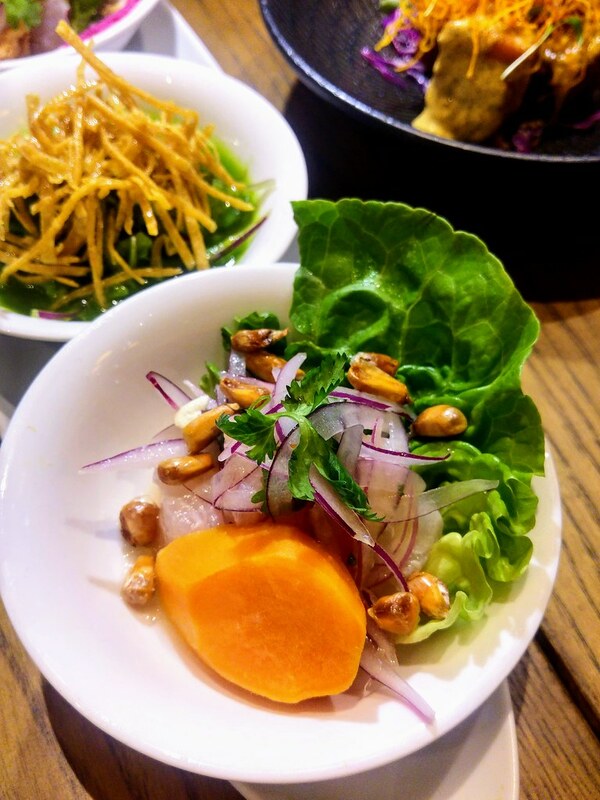 Compare to other ceviches I tried, and from my recent memories would be Kinou's, TONO's Peruvian ceviches are crafted with more ingredients layering on top of one another and by far the most aesthetically pleasing. Each one has a good textural contrast with the help of different ingredients. 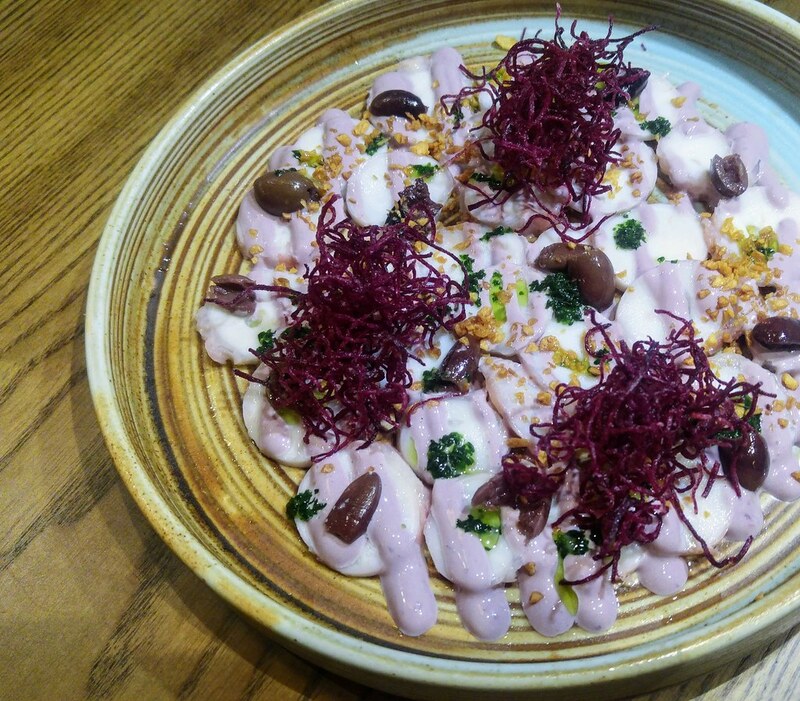 The most outstanding would be Ceviche Tono ($28) brushed with a purple hue from mashed purple potato. The fish cubes were firm with a bite, with an added crunch from the crispy baby calamari; the elusive smokiness embedded in the smoked aji amarillo tiger's milk was a touch of sophistication. A mixture of jalapeños, lime and herbs gives Ceviche Verde ($28) a stunning green hue. Sweet, fruity and spicy, the concoction was highly addictive and so were the rest of them. It's no wonder that tiger's milk is potentially a cure for hangover. There is a lot going on within this bowl - there were prawns, calamari, fish and crab and on top of that, there was corn tortilla crisps. That just makes it even harder to stop. Ceviche Clasico, the classic version is trademarked with a sweet potato. Like the rest, it has toasted peanuts to give it an aromatic crunch. As ceviches are essentially cold and citrusy, these crunchy elements fuel the dishes with pockets of warm and aromatic flavours. 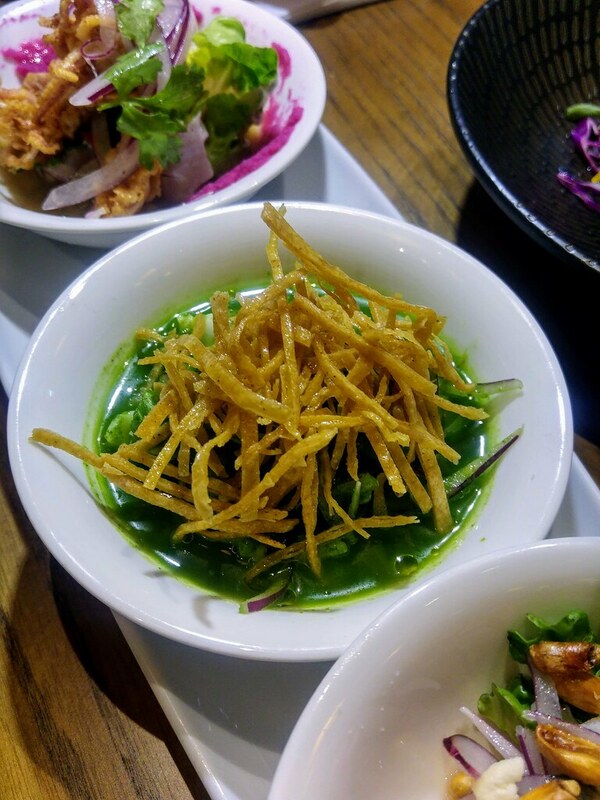 Tiradito "Japan-Peru" ($26) is another dish that embodies the influence of Japanese immigrants on Peruvian cuisine. 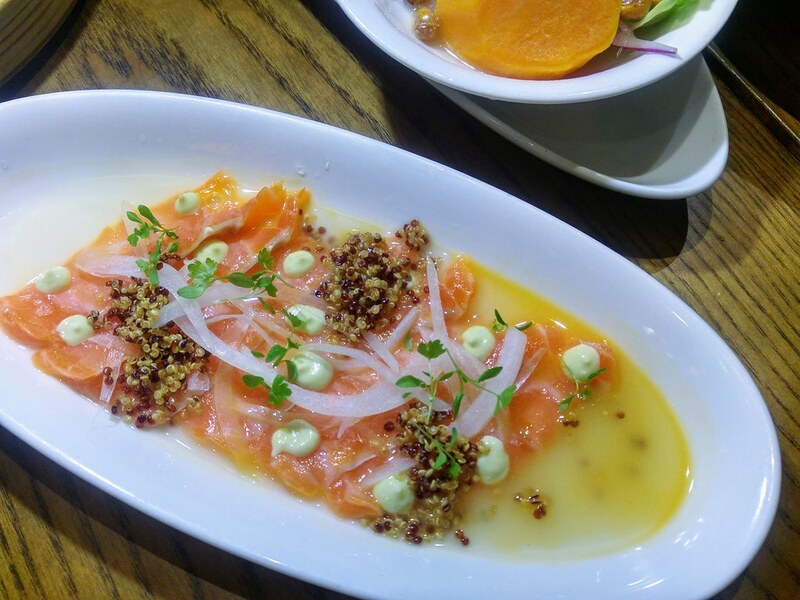 It is a Peruvian dish of raw fish and we have sliced salmon trout, executed in a way similar to carpaccio. Pulpo "Al Olivo" ($28) is elegantly presented in shades of purple. The thin slices of octopus is dressed in black olive mayo, dotted with chimichurri and spiked with crispy garlic for a hike of flavour. The black olive mayo is intriguing, as it seems to carry a hint of grape flavour. A little less of the mayo would be ideal, so that I could appreciate the octopus slices more. 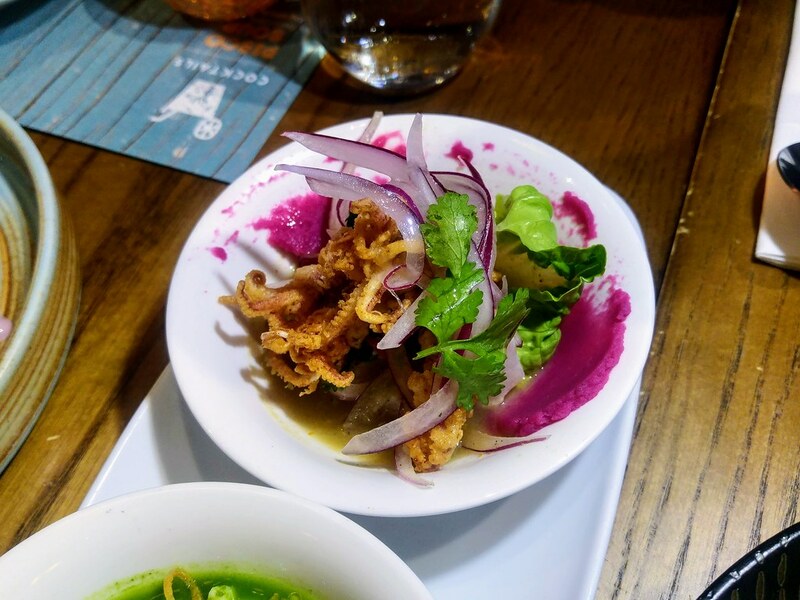 Digging deeper into the history of Peruvian gastronomy and you will discover the relationship between Africa and Peru as well. You would not find the original Anticuchos (cow's heart) here but in place is a refined dish using beef ($25). 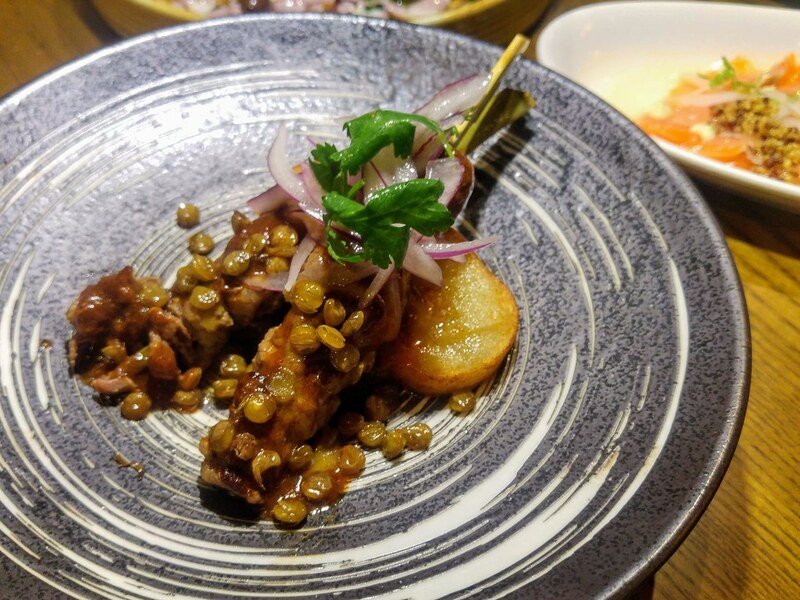 These char-grilled skewers were tender and flavourful with robust Anticuchera sauce and aromatic crispy lentils. A typical anticucho sold on street carts will have a slice of potato at the end of the skewer and you too, shall be entitled those iconic potato slices on your plate. I would highly recommended their Chicharron "La Lucha" ($26). Each crispy pork belly cube was plump with a good layer of fats and tender meat, with a crust that didn't disappoint. It just gets more decadent as you bite into it, as the Peruvian chilli mayo smoothes its edges with its sweet creaminess, while it mingles with the juice and fats. Others may just stop there but TONO owns this dish with a brilliant touch of vibrant orange zest. 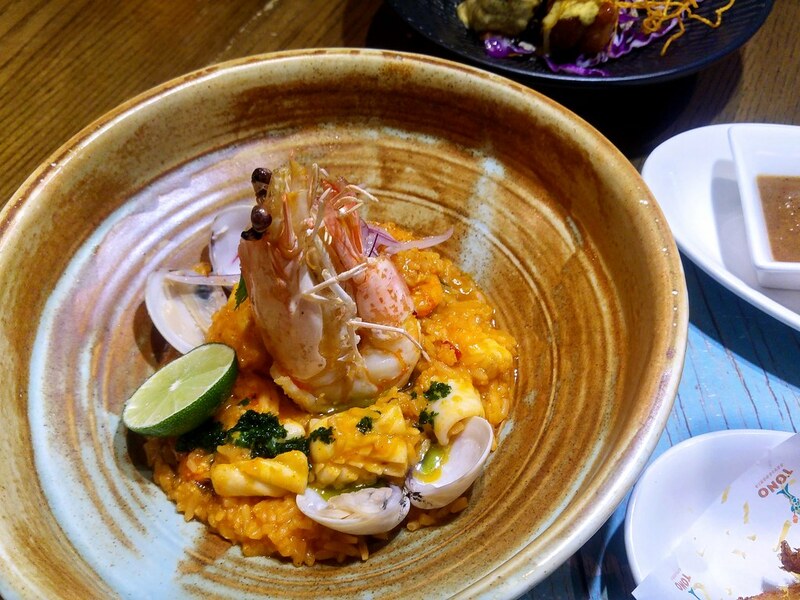 Showcasing its deep Italian roots is Arroz Con Mariscos ($36), a special seafood rice with an appetising orangey coat, not from saffron but the fruity aji Amarillo, a yellow pepper of medium heat. There's aji panca as well, for a touch of smokey flavour. It is so full of zest, I like it much more than the usual paella! In Peru, although ceviches are their national dish, they are generally expensive. What's even closer to their heart is this Chicken A La Brasa ($34), an everyday food. This Peruvian style roasted half spring chicken is served with Huacatay sauce, a native Peruvian herb that carries a pungent aroma similar to mint or basil. 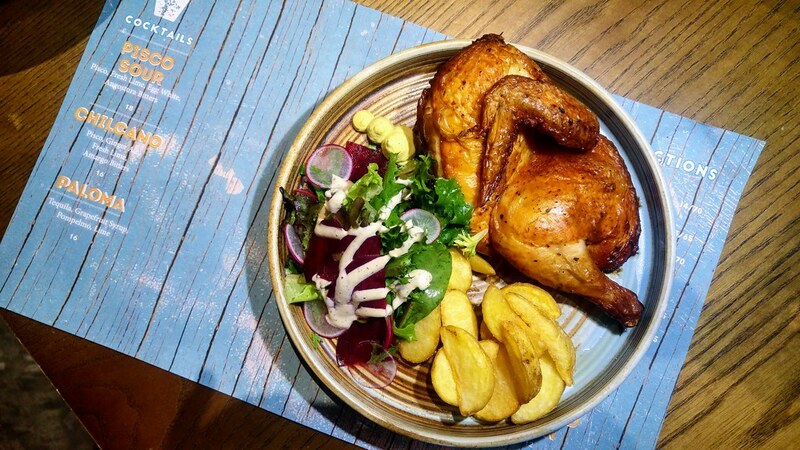 Be prepared to wait up to half hour but the wait is worth it when you see a gorgeous golden brown chicken served to your table. For mine, all the fats seemed to have melted into the meat, resulting in succulent meat and crisp skin. I love the ribs the best, where all the spices get rubbed into and absorbed during the cooking process. When every dish from beginning till end was so stimulating, Tres Leches ($12) concluded the meal with a simple, yet mesmerising note. I was blown away by how simple this dessert seems to be, yet so satisfying. 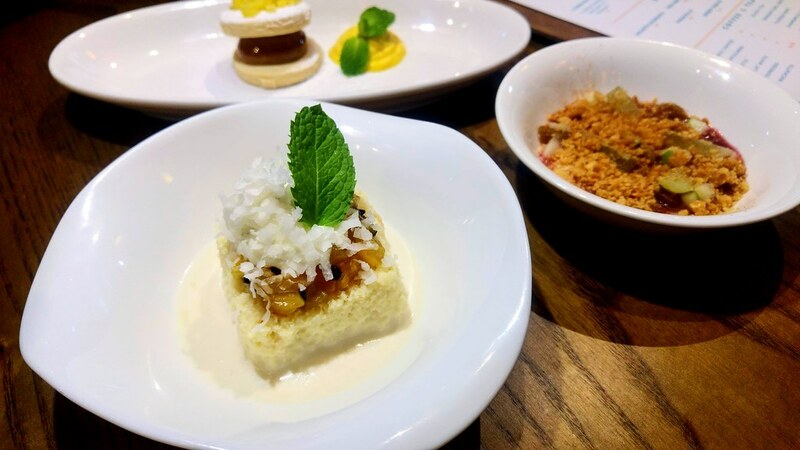 Atop of the moist coconut cake is a layer of pineapple and passion fruit compote that has been cooked down to achieve a thick consistency. It is a sweet and tangy, a perfect match with the light coconut cake. 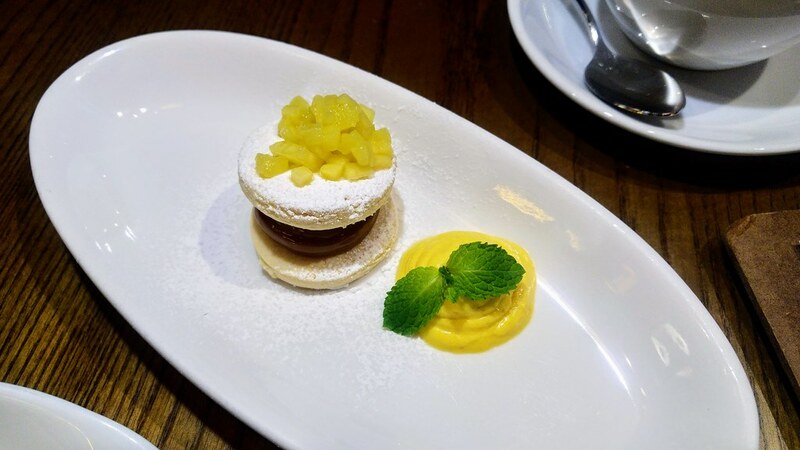 If you like caramel, you will love Alfajores ($12), served with mango mousse. The butter cookie is filled with "Dulce De Leche" which is obtained by painstakingly cooking down condensed milk. With such rich body, it was surprisingly just mellow sweet. 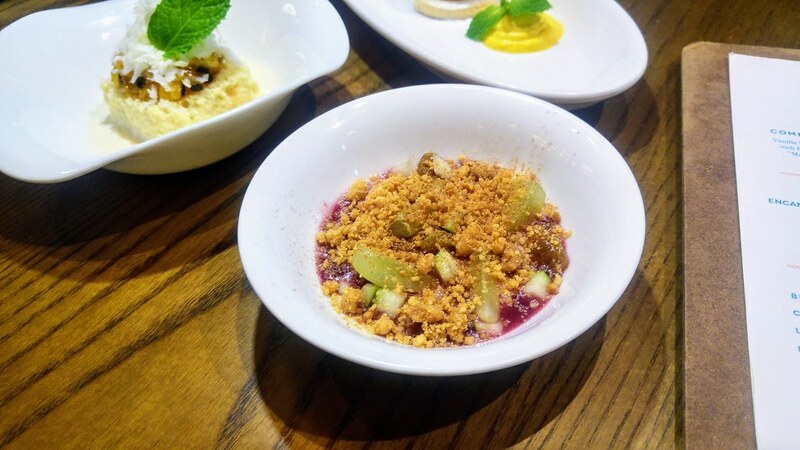 For something very local, Combinado is a homely bowl of sweet vanilla rice pudding, made from purple corn and fruit. Again it looks kind of simple like your everyday oatmeal but the purple corn has to be cooked and strained. I like the butter crumbs on top which gives it bit of texture but overall it is slightly too sweet for my liking. 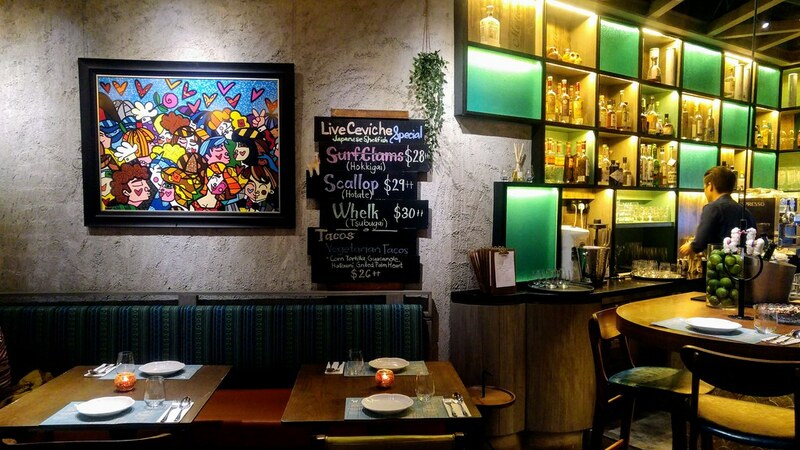 TONO Cevicheria is one of its kind. While concepts these days are mainly about "deconstruction", "fusion", "innovation" that try to play with thousand and one ingredients and cooking methods, these down-to-earth dishes are just proud and contented with who they are - bright, energetic, zesty and simply delicious.